"It was the best of times, it was the worst of times." From "Tale of Two Cities" (1859) by Charles Dickens. Dickens was 99 years early in his assessment of my Novice career. I was licensed in Aug. 1958 as KN4ZLE and upgraded to General in the winter of 1959. I was a young buck mesmerized like a doe in the headlights of radio technology. 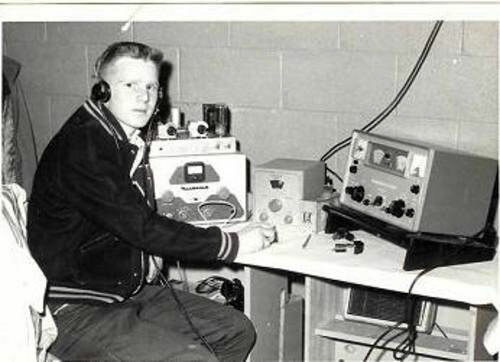 But I was also a poor young buck whose first rig was a 6L6 xtal osc TX feeding all 5 watts or so into a 40 m folded dipole at 20 feet peak. My receiver was an old WW II ARC-5/BC-455 that I had purchased for $5.00 and converted myself. I had two xtals. I think the frequencies were 7.173 and 7.167. [Of course, you know the significance of "73". As it turned out, I graduated from the US Naval Academy in 1967.] I didn't have much of a station, but I learned a lot building the TX and modifying the RX. I still have both, or what is left of them. The receiver was subsequently made into a double conversion receiver with a second IF of 455 kcs., a product detector and tunable BFO. The forty meter CW Novice band were extremely busy in those days. I have more CQs logged than QSOs and more QSOs with ‘LOST' in the remarks column of the log than without. Those were the worst of times. But I learned to copy CW in adverse conditions, which put me in good stead for later DX operations. I cherish every QSO I made and was a 20 wpm plus straight key novice before I upgraded. My first non-scheduled QSO was with Stephen, KN0OXJ, in Kennett, MO, about 100 miles away. Years later, while operating from Antigua as K4ZLE/V2A, my first QSO, also unscheduled, was with the same guy, but his call was now KM0L. [Today he is K0OU.] I could list the many friends and acquaintances I have made through this hobby, but the list would be enormous. From the novice days I have to mention K(N)4RCZ, who moved in across the street from me and inspired me to get my license. After all, "If Ray can learn that stuff, so can I!" The other is K(N)4BMO. Bill moved in two houses down the street from me and was (and still is) a mentor in many ways. What a crazy time the three of us had having working each other on 40 m CW when we could have opened our windows and yelled at each other! Once I graduated from high school I went into the Marine Corps and was trained as an aviation electronics technician. When I graduated from the Naval Academy, I went back into the Marine Corps and became an aviation electronics warfare officer. Obviously my early experiences as a novice carried over into my adult life and had a major impact on the direction my life took. Those were the best of times.